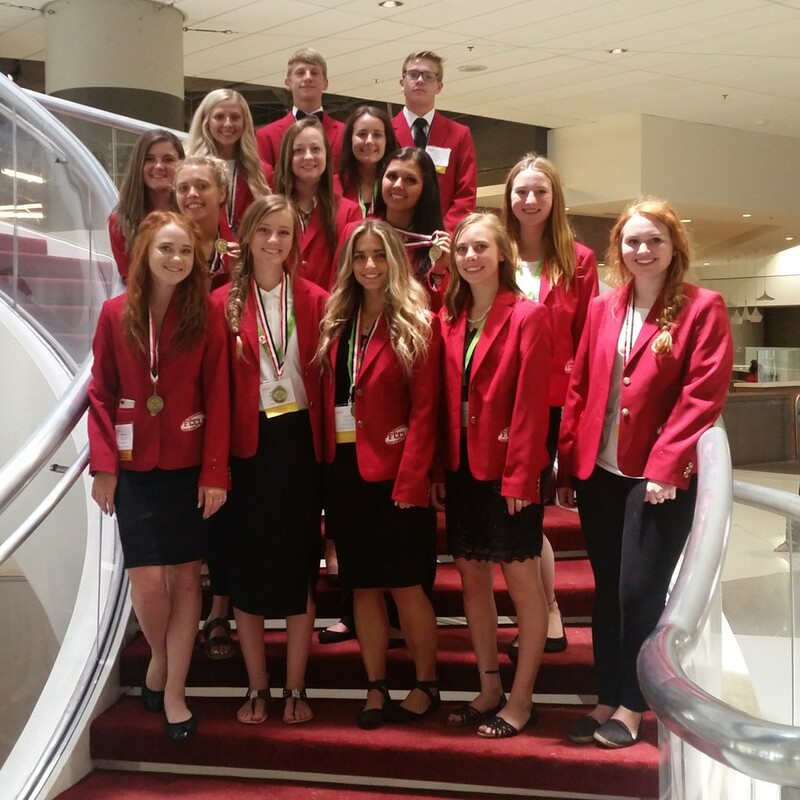 Following great success at National Competition in Atlanta, Georgia, Sanford high school FCCLA (Family Career and Community Leaders of America) Chapter anticipates continued success. Fifteen Sanford high school students qualified and attended the National Leadership Conference. It was one of the largest groups from a single high school attending the conference. A record setting attendance of over 7500 FCCLA student leaders, members, and advisers poured into the Georgia World Congress Center during the five day conference. During the conference students come together to realize their full potential through competition, career training, and workshops. Fifteen students from Sanford High School earned their right to compete in National Competition by placing 1st or 2nd at State Competition held earlier in April. Students worked all school year on their projects. The emphasis of many of the projects included improving one’s self, family, and community. Each one of the projects required many hours of planning, communication skills, organization, speaking skills, and creativity. In the end, all of the preparation earned gold and silver medals for Sanford students. Morgan Edwards, Taylor Larsen, and Lacy McCarroll competed in “National Programs in Action”. Their project focused on honoring our veterans by doing several services for local veterans as well as teaching elementary students the importance of honoring our Veterans and showing that by honoring our Nation’s Flag. They received the highest award given at National competition, a gold medal. Ariel Caldon, Harmony Peterson, and Abbey Sittler competed in “Focus on Children”. They developed a curriculum for elementary students and then taught them lessons on how to have a positive attitude and the difference it will make in their life. They too received a gold medal. Aisley Anderson, Meredith Anderson, and Shallyn Smith competed in “Environmental Ambassador”. Their project focused on teaching Jr. High and High School students as well as the community about the importance of “Going Green”. They were awarded a silver medal at Nationals. Karley Caldon, Sheridan Peterson, and Brady Lenz competed in “Chapter Service Project Portfolio”. To do compete in this you must lead and involve your FCCLA Chapter in a service project that improves your community. They chose to bridge the gap between young and older generations. Their service involved visiting the local nursing home several times, making a Christmas craft at the nursing home with the residents including designing and constructing a “Walker Pocket” for each resident so they can carry their possessions on their walkers. They were awarded a silver medal at Nationals. Clay Canty, Lauren Canty, and Thomas Faucette competed in “Interpersonal Communications”. Their project concentrated on eliminating drug use through communication skills. It targeted Jr. High students by teaching communication skills, the dangers of drug use, and refusal skills. They were awarded the gold medal at Nationals.